Available starting September 22nd, when you’re staying at certain non-Disney resorts, you’ll be able to buy a money saving Quick-Service Dine Gift Card, but only for a limited time! This is like the Disney Dining Plan which lets you pre-pay for your food, but it’s only been open to guests staying at Disney-owned resorts. It’s available for travel dates from September 26, 2016 thru April 4th, 2017. You must have a hotel package at one of these hotels, along with a minimum 3-day Disney World theme park admission ticket. 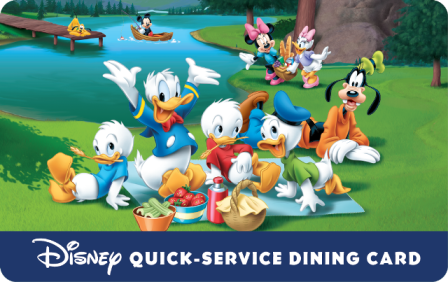 How much does the Disney Quick-Service Dining Card cost? $40 worth of credit for adults with a charge of only $35 per day. $15 worth of credit for kids with a charge of only $12.50 per day. So for example if you buy a 3-day card for an adult, you’ll pay $105 for $120 worth of credit! Saving anything at all at Disney is always a help to most people! You can load your Gift Card up to $400 for adults and $150 for kids. You can use this at select Quick-Service Dining locations or food carts in the Disney World theme parks, Disney Resorts, Water Parks and at Disney Springs. When you check in at your hotel, you’ll get your park tickets and Dining Card. So this is another way that you can save some money and enjoy some convenience of pre-paying for at least some of your food while you’re at Disney World.